What a breathtaking and marvelous experience! I can’t thank you enough for the positive impact rolfing has made on my life! I wanted you to know how well I’m doing! I have had virtually no neck, sacral,or low back pain innearly two months! And I’m sitting and driving as much as ever, to say nothing of my usual stress! After one session my arm is 80% better! I will be able to finish my paintings and meet my deadline! 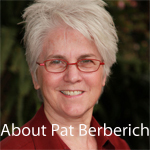 I have been working with Pat Berberich since 2004. She is a most dedicated professional with a focused commitment to her clients’ health needs. Her clients repeatedly report back to me their gratitude for her work. when often most other therapies have failed.. She practices The Rolf Method of Structural Integration (Rolfing), a unique type of hands on work. She is sensitive to her clients’ comfort thresholds so that, while the manipulation is deep, it is not painful. Pat’s work is uniquely skillful in that she brings an educated and most compassionate approach to her clients. Many have been helped with chronic pain and movement problems such as frozen shoulder, sciatica syndromes, neck, midback, and lower back pain, postural computer use problems, among other conditions. I highly recommend her to anyone who wishes to enjoy life more – have freedom from pain, enhance performance, achieve postural CORE integrity, and gain relief from chronic musculoskeletal pain.